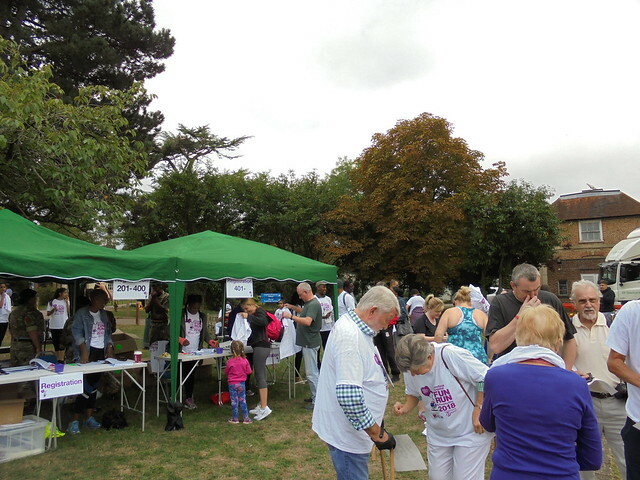 On Sunday 9 September, the last day of Organ Donation Week, over 700 supporters came to raise funds for Harefield’s Transplant Appeal. Participants ran, walked or jogged one of three routes – 2, 5 or 10km – set in and around the grounds of Harefield Hospital. One of the participants taking part was Rebecca Henderson who has a totally artificial heart (TAF). A patient at Harefield, Rebecca is the 19th person in the UK to get a TAH, the only person in the world with a TAH as a treatment for heart cancer. She took part with friends, family and pet dog Susie (pictured left). For some, the Harefield Fun Run provides an opportunity to celebrate family members who have been given a new lease on life, thanks to the expertise of staff at our hospitals. For others, it's to remember a loved one and show gratitude to the care received at Harefield. Like Sophie and Hannah Paige (pictured right) who ran in memory of their mum who had a heart transplant at Harefield but sadly passed away two years ago. “We love everyone getting together, doing a bit of exercise and then have fun all together afterwards." Post-race, our Family Day offered a range of entertainment, arts and craft stalls and food carts, as well as some fantastic performances from Singing for Breathing and local dance troops. Harefield Hospital Radio broadcast the event with the Harefield TV camera also there to capture the day’s events. Thank you to everyone who came along to help us raise an incredible £43,095 (and counting!) and to our volunteers, including Uxbridge District Explorer Scouts & Army Cadets. Special thanks to our lead sponsor Kier Construction and their two special mascots, and to Cocofina, Grant & Stone, ISS, Candy Kittens, Nature Valley and Sun-Maid Raisins. See all of the pictures below! If you would like to support the world-class Transplant Programme at Harefield Hospital by giving to this appeal, click here.